Creating a sustainable identity for Nebraska's energy advocates. 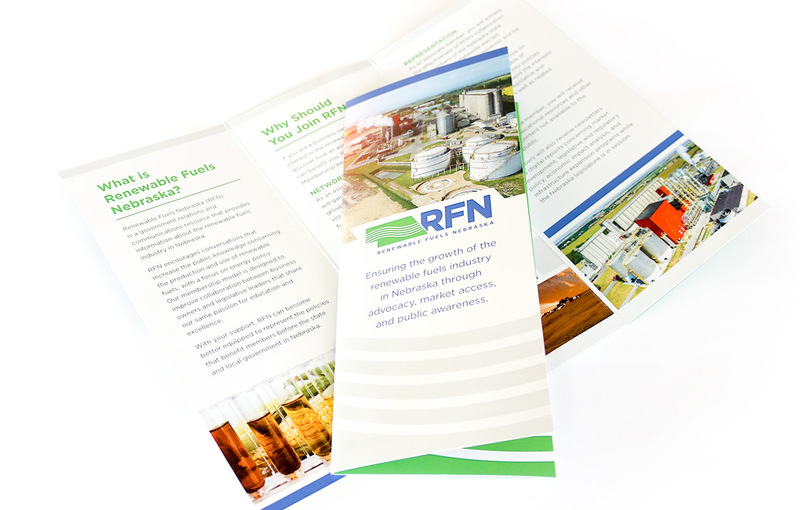 Renewable Fuels Nebraska, formerly the Association of Nebraska Ethanol Producers (ANEEP), is a government relations and communications resource that provides information about the renewable fuels industry in Nebraska. C3D partnered with RFN Executive Director, Mark Palmer, to develop a new logo and identity along with a mobile-friendly website to support their new communications strategy in 2017. We knew from the start that working with a longer name like Renewable Fuels Nebraska could pose some challenges in developing a clean identity. Our team worked to developed a strong and recognizable icon with the RFN acronym accompanied by a stylized representation of the state of Nebraska. We also carried through the 4 bars used in the original ANEEP logo which allude to flowing fields, energy in motion, and also the transmission of information—which is the core focus of RFN. This flowing bar along with the angles of icon, are design elements that can be carried through all branding moving forward. By utilizing a clean sans serif typeface, the Renewable Fuels Nebraska name was easily added to the logo without sacrificing legibility at smaller sizes. We kept the same blue and green color scheme that was already in place through ANEEP, but gave the colors a bit more punch to enhance the brand and stand out from their competitors. To inform new and prospective member of RFN, C3D created printed brochures and take-one cards featuring the new logo and branding. 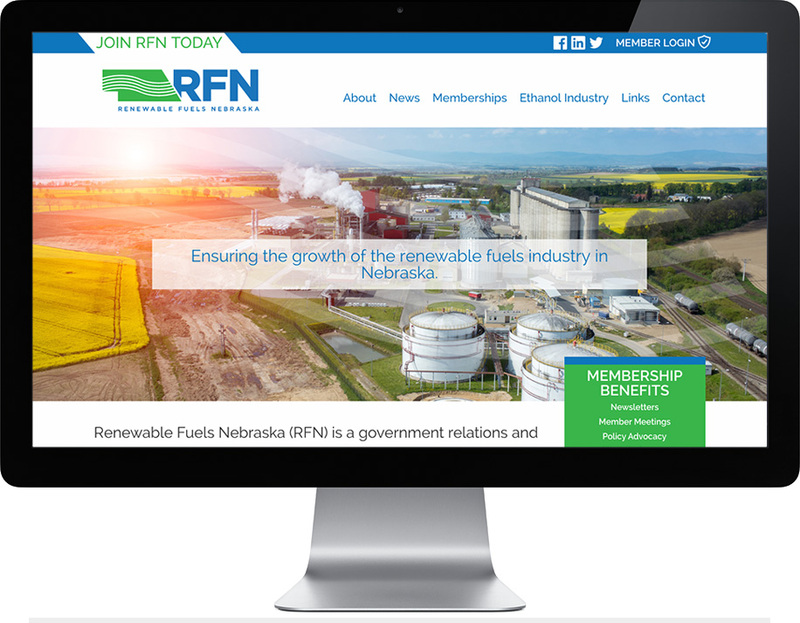 The Renewable Fuels Nebraska website features a fully responsive and mobile-friendly design, providing a seamless user experience for users on any device. The C3D team worked closely with Mark to create original graphics and supporting copy for every page on the site. The site also boasts a hidden content area that is accessible only by RFN producer and associate members. Additionally, the site provides a method for new visitors to apply for memberships of their own to get access. By engaging in conversations on social media and offering a place on the website for members to remain informed, the organization has made tremendous leaps toward the modernization of their communications and marketing strategy for 2017. Corporate Three Design outfitted the RFN team with a content calendar to keep track of all internal and external communications; including social media updates, blog posts, press releases, and event coverage. The website's RSS feed also integrates with RFN's relevant social media channels to ensure audiences across the web are never left out of the loop.